Brad “Whitie” Ecklund was a Milwaukie native, an Oregon all-star, bulwark of the 1948 Cotton Bowl offense, two time Pro Bowl center in the NFL, and assistant coach for five NFL teams over 20 years. And, from the time he first laced up the cleats at Milwaukie High for the freshman team in 1937, until his last appearance as a Duck in the ‘49 Cotton Bowl, he started every game he played as an amateur. Ecklund is broadly considered the greatest center in Oregon football history (sorry, Max Unger, but you weren’t a four-year starter at center). And it’s unfortunate that he’s almost unknown now. The Oregonian and R-G each had a perfunctory obit for Brad Ecklund, but nothing worthy of a player of his literal and figurative stature. So, here’s a look at the career and life of one tough SOB. As a senior in high school at Milwaukie, “Whitie” was named to the Metro all-star team at fullback. He was a four-sport star — baseball, track, basketball and football — and was drafted by the Philadelphia Athletics, but turned down baseball for a full ride at Oregon. He never played for a team — frosh, varsity, military or Oregon — that he wasn’t named captain of. And he never played in a league where he wasn’t named on the all-conference team — at fullback in high school, at center on the military teams and at Oregon. 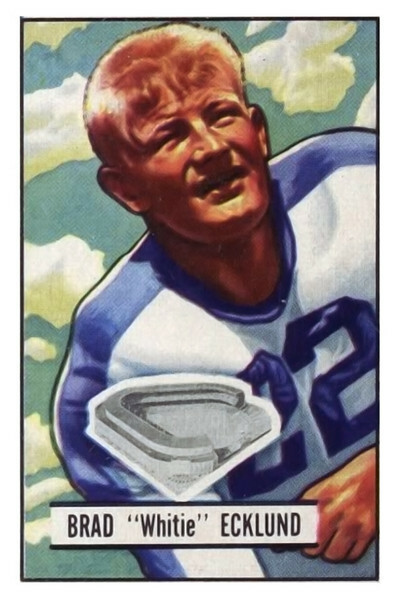 Ecklund matriculated at Oregon in 1941, expecting to play fullback. But the Webfoots were loaded in the backfield, and weak up front. Coach Tex Oliver looked at the massive Ecklund and moved him to center on offense during fall camp; he played linebacker on defense. By the first game, at Stanford, he was first string. He started every game.. but flunked out of school. Just in time, WW2 intervened. Ecklund joined the Marine Corps, and took up boxing for fun. Naturally, he became the Marine Corps Golden Glove champion. He played for the Navy Pre-Flight football team in Jacksonville, Florida for two years before being dispatched for overseas duty at Okinawa. He learned what it meant to be a member of team in the South Pacific, fighting in interminable battles from island to island. “I was in the second wave,” he told the R-G’s Bob Clark in a 1993 interview. “It was the guys in the first wave who got their butts shot up.” Ecklund thought the fact that the late-40s Oregon players had all gone to war made them a more dedicated and mature unit with a special bond and a more businesslike attitude to the game. The man one sportswriter called “the indestructible giant” returned to Oregon in ‘46, and picked up where he left off. By being four years in the service, they forgave me for flunking out … When I came back, I never made less than a B average. I’d matured and realized what I almost lost. In the next three years, playing both sides of the line, he averaged over fifty minutes per game. He was All-PCC in ‘46, ‘47 and ‘48. On that great ‘48 team, Ecklund played all 60 minutes of five games — Stanford, USC, Michigan, St Mary’s and Washington — and was only knocked out of one game all year, when an Idaho player kicked him in the head 4 minutes into the 3rd quarter. He graduated in 1949 with degrees in health and physical education. He passed up a contract offer from the Green Bay Packers, choosing to join the upstart All-America Football Conference’s New York Yankees for more money. He stayed with the franchise as it moved from New York to Dallas, then signed with the NFL’s Baltimore Colts. In 1953, Ecklund was named the most valuable offensive lineman of the Colts, an honor for which he received all of $100. Having achieved that career milestone, he quit the team and returned to Oregon to coach high school football. 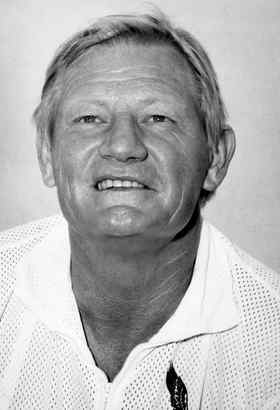 Brad Ecklund, Eagles assistant coach in the 1970s, via media.philly.comEcklund was an assistant to Len Casanova’s late-50s Oregon teams, then jumped to the NFL in 1960, where Tom Landry gave him his first coaching gig with the new Dallas Cowboys. He moved to the new Atlanta team in 1966, where he coached under his former teammate Norm Van Brocklin, and later coached at New Orleans, Philadelphia and Chicago.Ecklund retired from coaching in 1979, and spent most of the rest of his working life as a substitute teacher in the Philadelphia area.. always keeping his teaching certificate active in the states his children lived in, so he could stay close to his grandkids. He’s a charter member of the Oregon Sports Hall of Fame. Here’s to you, Whitie. Wherever you are, keep snappin’.